The Challenges Of Making A Film In Saudi Arabia : The Two-Way The film about a girl and her desire to ride a bike has been well received internationally. But few Saudis have seen it because the country does not permit movie theaters. 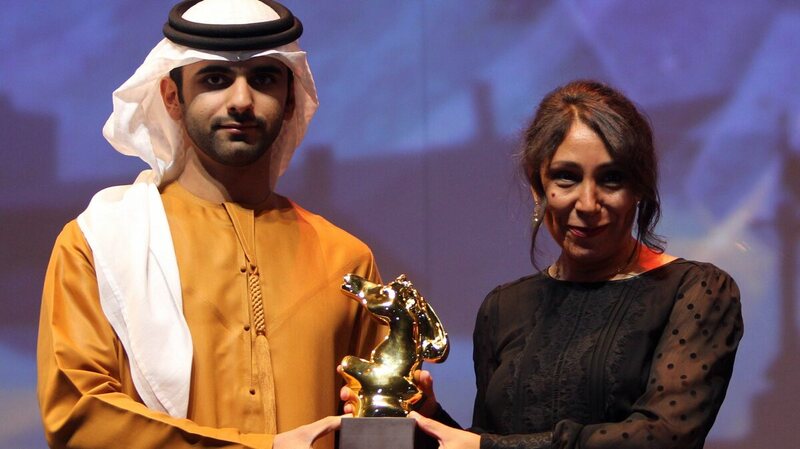 Saudi Arabia film director Haifaa Al-Mansour (right) receives the award of best film for her movie Wadjda at Dubai International Film Festival in Dubai, United Arab Emirates, on Dec. 16, 2012. The Saudi Arabian movie Wadjda has been on a winning streak. The film, about a young Saudi girl who hatches a plan so she can ride a bicycle in her conservative country, has been honored at the Venice Film Festival, the Dubai International Film Festival and the Gulf Film Festival. Haifaa al-Mansour, the first woman to direct a film in Saudi Arabia, was feted a week ago at the Tribeca Film Festival. So how's the film doing in Saudi Arabia? Well, there are no movie theaters in the desert kingdom. Saudi Arabia's strict interpretation of Islam is the backdrop for most every aspect of the film. Females are not allowed to ride bikes or drive and they cannot travel abroad without the permission of their male guardians, usually a father, brother or husband. The absence of theaters means Saudis have not been able to see this movie, unless they view it abroad. Most Saudis will have to wait until it becomes available on DVD or is shown on a satellite channel they get at home. Making any movie in Saudi Arabia is not easy. It was especially difficult for a women, and al-Mansour had to go to great lengths to make it happen. She had to stay inside a specially customized van equipped with monitors and communication devices to work on scenes shot in the streets of the capital Riyadh. Otherwise, she could have faced problems with authorities for being a woman on the street without a male guardian. Speaking before the premiere of Wadjda in New York City, al-Mansour told the crowd: "I tried to make a film about hope, embracing change and moving ahead." Al-Mansour has been challenging the restrictions on Saudi women for some time. When she married an American diplomat in 2007, she arrived to the wedding driving a golf cart. Before Wadjda, she directed three short film and one full-length documentary. The 2005 documentary, Women Without Shadows, sparked controversy at the time because it featured interviews with Saudi women of different ages, backgrounds and ideologies, speaking about their lives. But she has always made it clear that she prefers to make drama over documentaries. She moved to Australia where she received a master's degree in film studies from the University of Sydney, then returned home to make Wadjda. A scene from Wadjda, the first film made in Saudi Arabia by a female director. The film has been prominently featured at a number of international film festivals, including the Tribeca Film Festival in New York. The mere fact that the film was made shows the ways in which the country is changing. While there are no movie theaters, a new generation of young directors is experimenting with films as YouTube makes it easier than ever to share their work with the audience inside and outside the country. The video sharing site has enjoyed a phenomenal growth in Saudi Arabia. About 80 percent of the daily views of YouTube videos in the Middle East come from here, according to Google's Head of Emerging Arabia, Abdulrahman Tarabzouni. The country has so far avoided the mass protests that swept other countries in the region during the last two years, but the use of social networks has grown rapidly with increasingly critical voices demanding change and reform. The government has been slow to respond to these demands, but the adoption of modern technology by Saudi Arabia's young population combined with increased political awareness is putting more pressure on the government to change. Al-Mansour said it will take time for long-held beliefs to change, and that such gradual change might be necessary in such a deeply conservative society. Still, she says, "It's an exciting time in the country now." The film is expected to open in U.S. theaters this fall.